The internet is an ocean of information, sometimes a little too crowded for people to find what they want, and a bit difficult for businesses to get their point across. That’s where digital presentation comes in handy. In today’s online tool review, I’ll be showing you how to use SlideShare for marketing and keep in mind that this can be applied to any type of online businesses. I am sure you’ve seen one or two slides in your online search, but do you also know about these interesting numbers that are supporting the social network? Yes, SlideShare is a social media platform simply because it aggregates and share information from the online community which at current, stands at 80 million users and counting. It is one of the top 100 most visited sites globally. The network gets about 159 million page views per month and 9 times more users on mobile versus desktop. 41% of businesses in North America are already using presentations to engage with new customers. There are about 40 categories that cover topics in a variety of fields. More than 80% of the online traffic comes from the search engine. Having another venue to share business content, especially for free, is always welcomed. Unlike other platforms that are more quirky in nature, the fact that it’s commonly used by professionals and field experts, gives an advantage of reaching out to people who are interested in solid information. Complex information can be broken down into smaller pieces, making it easier to deliver. Simple visual and data representation help viewers to perceive and understand a topic better. Given that most people have a short attention span these days, small decks of slides are often more receptive over long text-based information. And it’s not just conference material – you can also share documents, articles, infographics and videos through the same format. If you already have a blog, creating slides will help to repurpose the content to increase traffic and your online presence. Are you seeing the opportunities already? Great! Now, let’s see how you can get started. Signing up is pretty easy and it can be done using your preexisting Linkedin or Facebook account. Take some time to fill out the profile page, include an avatar and describe the nature of your work or industry. It’s also a good idea to include your company’s website here as a reference. Content, in the context of SlideShare, basically means the topics that you intend to deliver through the presentation. Regardless of where the information source is coming from, it’s important to conduct a keyword research first to find out what topics are in demand in your niche/industry and easy to rank in the search engines. Such topics will subsequently be used as titles to attract the viewer’s attention and serve as the focus point to keep the rest of the slide content relevant to one another. Bloggers should already be familiar with this technique as most articles nowadays are crafted based on long tail low competition keywords. What is left to do next is to extract the important points from the targeted topics and organize them into slides. SlideShare only accepts a few formats such as PDF and Powerpoints to be uploaded as slides. Ideally, these files should also fit into the presentation specs otherwise they would look very disproportionate on the viewing board. Another thing to look into is the designing element, because if your slides consistently appear on dull backgrounds, they would be boring to read. Fortunately, there are many (free) resources that provide templates which can be used out-of-the-box. There are those produced by marketing professionals such as the templates from Hubspot and those that can be created from scratch. As a DIY person, I like to use Canva designing tool to come up with attractive visuals for my blog. It’s a freemium software, easy to use and there are a variety of modern looking templates to choose from. When creating a design, simply select ‘Presentation’ and choose the layouts that best fit your content. In the following steps, everything is subjected to creativity as to how you want to make the slides look attractive. Here are some tips to keep you on the right track. Keep the slides short (less than 30 words), simple and straight to the point. Use visual elements to emphasize on content, but do so sparingly. If you create your own YouTube videos, those can be added to the slides as well. Ensure that the overall content is easy to read and makes people want to click onto the next slide. To give you a better idea, here’s what an engaging SlideShare presentation would look like. Important tip – Remember to add click-to-action (CTA) links, prompting viewers on what to do next. You may link to other websites or certain blog posts for more detailed reference, but keep in mind that the links would only appear from the fourth slide onwards. Anything prior to that, will not be shown. This simple step is the strategy that contributes to more leads for businesses as well as more sales conversion for online marketers. Therefore, make sure that the CTAs are visible and the instructions are clear to the viewers. After the slides are completed, now it’s time to upload them. If you are using Canva, save the file as a PDF and it will transport all the links that are embedded within the slides. Videos, on the other hand, can only be added after the slides are in place. On the uploading interface, you’d see a few columns on the right hand side. Just like configuring the settings for SEO on a blog, these columns need to be filled out accordingly so that it’s easier for users to find your content within SlideShare as well as on the search engines. Title – Topic of the slides containing targeted keywords (see point #2). Description – A summary of what the content is all about. Tags – Keywords that are relevant to your niche or industry. Privacy – Option to choose either to share the slides in private, limited space or public domain. 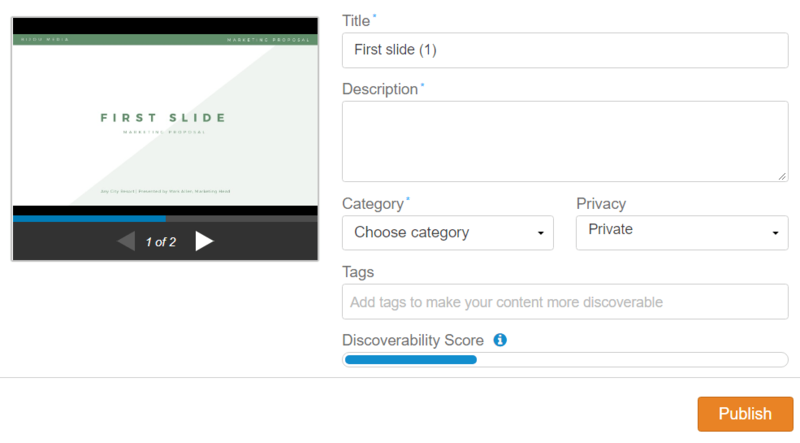 Discoverability Score – A color coded score to show how much information you’ve provided. Blue for minimal to moderate and green for optimum. Just like blogs, a SlideShare content can be cross promoted to other platforms. For now, it only extends to Facebook, Twitter and Linkedin. Alternatively, you can also embed a presentation on your site. I know it’s not a common practice, but it’s something to experiment and an option for readers to consume bite-size content if they don’t want to read the whole thing. Finally, don’t forget to track the progress of the content sharing through the analytic feature that’s available within your dashboard. It will show you how many viewers and social shares that occur on a particular content and reflect on what can be done (if needed) to improve on those numbers. Ready To Create Your First Slide? Well, I did one with a recent blog post of mine and it was surprisingly easy. I thought I would fumble, but the templates on Canva made it achievable and I already have a few (older) articles in minds that I would like to turn into slide content. What about you? What do you have within your business information that can be made into interesting visual points? I hope this article has helped you to understand how to use SlideShare for marketing at a greater scale online and that you will experiment with it fairly soon. If you like to know more about growing a successful online business, feel free to check out my recommended training platform for additional resources. Question – Have you used SlideShare before? Please share your experience in the comment space below. I first bumped on the SlideShare while doing a random search on Google regarding something I was writing on. The information was well presented in slides and made it really easy to go through. I’ve never considered using it as a marketing tool, but now that I’ve just got into blogging, I believe it will come in handy. Thank you for showing me how it works. Your tutorial was very detailed. I have come across numerous SlideShare images on Google Image Search in the past – but I had no idea that it was a kind of social network! A really interesting choice for getting more traffic to your website/offers, I can’t believe that 80% of it’s traffic comes from the Google search engine. On average, what percentage of website traffic do you get from SlideShare – do you see good results from it? Hi Chris, I will provide a data for that when it becomes available. Still working on making the presentation slides for now. Thank you for your interest. I have never heard about SlideShare before until now. After reading this article I found that the SlideShare is a very essential tool that can be used for online marketing in different type of business. Instead of using Facebook or Instagram, this can be an awesome and professional-looking alternative. I like the simplicity of the platform too. So much great info – I am bookmarking this article! I have heard about slideshare before, but never thought that it was a tool I could utilize in my own business or use for presentations at work. You broke it down and explained everything beautifully. Thank you! I am so glad I found your website! I had never even heard of SlideShare before. Can’t wait to incorporate it in to my own online business. Thank you for the fantastic info. This seems like an awesome idea. I have heard about people distributing content on SlideShare, but I didn’t really understand the benefits of it until I read this post. I also didn’t know how widely it was used. Many articles on the Huffington Post have slides from SlideShare at the end and I have always enjoyed reading them. It seems to take some effort, but I think it would be worthwhile. I shall look into this platform to re-purpose my blog content.